Well-known Vietnamese blog Tinhte.vn today published images that reportedly show the design of Apple's next generation iPad Air 2. The pictured device has the same general form factor as the existing iPad Air, but includes a thinner 7 mm profile that measures roughly the same as the iPhone 6 and 6 Plus and thinner than the current 7.5 mm iPad Air. In line with previous rumors, the iPad Air 2 model also includes a home button with a Touch ID fingerprint sensor. 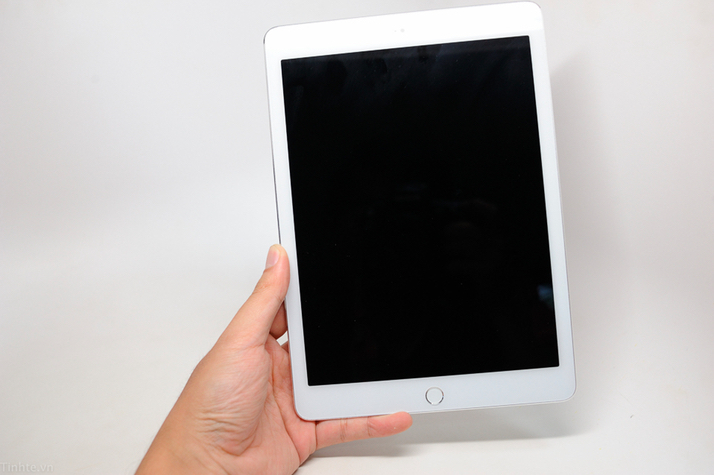 While this latest report includes detailed photographs and a video, they only give us a hint at Apple's next-generation iPad as the device in the photos is described as a dummy model used by accessory manufacturers to test out and showcase their designs and not an actual iPad Air 2 unit leaked from a Foxconn assembly line. Similar to previous leaks, the iPad model has the same external design features seen in earlier leaks and in MacRumors' own dummy unit on hand since June. Of perhaps most note, the Tinhte.vn and other dummy models include two distinctive small holes in the area of the rear camera -- one on the back and one of the side of the casing. The hole closest to the camera is undoubtedly for a microphone, while the other hole likely marks the presumed location of the mute/rotation switch, which is not depicted ini full on the models. Today's report and an earlier one have suggested this hole is for a microphone rather than simply marking the mute/rotation switch location, but we believe this interpretation is likely incorrect. Apple is expected to unveil its iPad Air 2 and possibly a new Retina iPad mini at a press event to be held on October 16. The next-generation iPad Air is rumored to included a faster A8 processor, anti-reflective display, Touch ID, and a gold color option. Touch ID and A8 is good and all, but more important to me would be to just go straight to the 32GB entry level. Enough with this 16GB BS.. It's an iPad.. Storage is key if you really want to get the business traveler market. So I'm going to need to buy all new cases just for .5mm less thickness? Seems pretty ridiculous. Just give us a slightly bigger battery. Meh, call me when Apple announces an iPad Pro. Until then, it's just more of the same. But will it have 2 GB RAM? Where are the invites though? Apple was so darn interested in making the invite paper thin, it's invisible. Yes, if you sit on it. I'll never understand why people will not put their reading glasses in their pocket and sit on them, but will put a thin electronic device in their pocket and sit on it. Stop this "thinness" obsession. It's not always better. FFS, this obsession with thinness needs to stop. What would you consider to be innovative? At this point, sufficient RAM (2 GB?) to prevent Safari tabs and other apps from reloading all the time.